The AMS Performance EVO VII/VIII/IX Brake Cooling Kit was designed for heavy braking situations like those experienced during road race and autocross. In factory form, the brakes on the EVO provide great stopping power but after sustained heavy braking they can begin to fade. By forcing airflow directly through the rotor vents this kit drastically reduces the temperature of the rotors, brake pads and calipers. Reducing the temperature of your brakes defends against brake fade and provides longer pad life. By installing the AMS Brake Cooling Kit you will have consistent stopping power throughout your whole session. 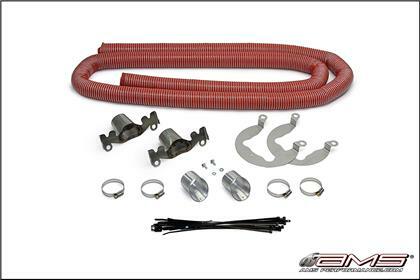 This kit replaces the factory dust shields with tighter fitting stainless steel shields and caliper ducts which forces more air to exit through the rotor vents. Very tight tolerances with the caliper ensure that all incoming air must pass through the rotor veins to cool the caliper. High temperature flexible silicon tubing is provided instead of cheap and weak dryer vent hosing that will deteriorate quickly. The aluminum air scoops provided are designed to be universal and fit in just about any opening in the bumper cover, even aftermarket body-kits. This is the only brake cooling kit approved by the SCCA for use in T2 Class.